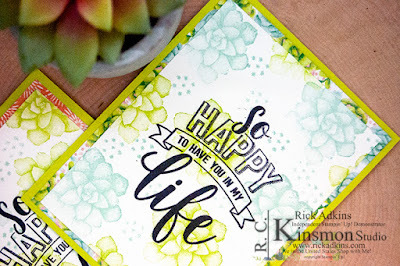 Hello and welcome to my blog and YouTube channel; today I am going to share with you the card that I made earlier today for this weeks episode of Rick's Saturday Simple Stamping. For My card today I used two stamp sets and some designer series paper. I used the Amazing Life Stamp Set, and the Painted Season Stamp Set along with some of the Painted Seasons Designer Series paper. Here's a closer look at my cards. For today's card I started out by stamping the background using the succulent image in Lemon Lime Twist and Pool Party Classic Ink on whisper white cardstock (3 3/4 x 5). I then used my Stamparatus to stamp the sentiment from the Amazing Life Stamp Set in Tuxedo Black ink. I used the stamparatus because I figured I would need to stamp it twice to get a nice crisp black impression. The Stamparatus makes this much easier than trying to line the stamped images up. I did do a little something different then most cards. Instead of using a piece of cardstock as my mat. I used a piece of the Painted Season Designer Series Paper as the mat. This not only frames the stamped image but adds a little more color and texture to the card. For the inside of the card I stamped a couple of the succulent images on a piece of whisper white and attached that to the inside of the card. That finishes my card for today, and for this weeks episode of Saturday Simple Stamping. Thanks for taking the time to stop by and view my post or watch my video tutorial. If you need any of the supplies you have seen today you can pick them up in my online store. Labels: stampin' up!, crafts, cardmaking #simplestamping, 2019 Stampin' Up! 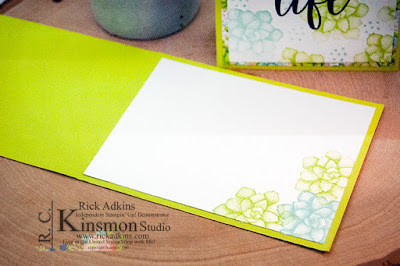 Occasions Catalog, Painted Season Bundle, rick Adkins, Stampin' Up!